Burgos ([ˈbuɾɣos], , ) is a city in northern Spain and the historic capital of Castile. It is situated on the confluence of the Arlanzón river tributaries, at the edge of the Iberian central plateau. It has about 180,000 inhabitants in the actual city and another 20,000 in the metropolitan area. It is the capital of the province of Burgos, in the autonomous community of Castile and León. Burgos was once the capital of the Crown of Castile, and the Burgos Laws or Leyes de Burgos which first governed the behaviour of Spaniards towards the natives of the Americas were promulgated here in 1512. It has many historic landmarks, of particular importance; the Cathedral of Burgos (declared World Heritage Site by UNESCO in 1984), seat of the Metropolitan Roman Catholic Archdiocese of Burgos, the Las Huelgas Reales Monastery and Miraflores Charterhouse. A large number of churches, palaces and other buildings from the medieval age remain. The city is surrounded by the Fuentes Blancas and the Paseo de la Isla parks. Castilian nobleman, military leader and diplomat El Cid Campeador is a significant historical figure in the city, as he was born a couple of kilometres north of Burgos and was raised and educated here. The city forms the principal crossroad of northern Spain along the Camino de Santiago, which runs parallel to the River Arlanzón. It has a well-developed transportation system, forming the main communication node in northern Spain. In 2008, the international Burgos Airport started to offer commercial flights. Furthermore, AVE high speed trains are planned to start service in the near future, stopping at the newly-built Rosa de Lima train station. The Museum of Human Evolution was opened in 2010, unique in its kind across the world and projected to become one of the top 10 most-visited museums in Spain. The museum features the first Europeans, which lived in this area 800,000 years ago. Burgos was selected as the Spanish Gastronomy Capital of 2013. There are several possible origins for the toponymy. When the city was founded, the inhabitants of the surrounding country moved into the fortified village, whose Visigothic name of Burgos signified consolidated walled villages (Gothic baurgs). The city began to be called Caput Castellae ("Cabeza de Castilla" or "Head of Castile"). Early humans occupied sites around Burgos as early as 800,000 years ago. When the Romans took possession of what is now the province of Burgos, the site had been a Celtic city. In Roman times, it belonged to Hispania Citerior ("Hither Spain") and then to Hispania Tarraconensis. In the 5th century, the Visigoths drove back the Suebi, then the Berbers occupied almost all of Castile in the 8th century, though only for a very brief period, and left little if any trace of their occupation. King Alfonso III the Great of León reconquered it about the middle of the 9th century, and built several castles for the defence of Christendom, which was then extended through the reconquest of lost territory. The region came to be known as Castile (Latin castella), i.e. "land of castles". Burgos was founded in 884 as an outpost of this expanding Christian frontier, when Diego Rodríguez "Porcelos", count of Castile, governed this territory with orders to promote the increase of the Christian population; with this end in view he gathered the inhabitants of the surrounding country into one fortified village. The city began to be called Caput Castellae ("Cabeza de Castilla" or "Head of Castile"). The county (condado) of Burgos, subject to the Kings of León, continued to be governed by counts and was gradually extended; one of these counts, Fernán González, established his independence. In the 11th century, the city became the see of the Roman Catholic Diocese of Burgos and the capital of the Kingdom of Castile. Burgos was a major stop for pilgrims on their way to Santiago de Compostela and a centre of trade between the Bay of Biscay and the south, which attracted an unusually large foreign merchant population, who became part of the city oligarchy and excluded other foreigners. Throughout the 13th and 14th centuries, Burgos was a favourite seat of the kings of León and Castile and a favoured burial site. The consejo or urban commune of Burgos was firmly in the hands of an oligarchic class of caballeros villanos, the "peasant knights" of Burgos, who provided the monarchs with a mounted contingent: in 1255 and 1266 royal charters granted relief from taxes to those citizens of Burgos who owned horses and could arm themselves, provided that they continue to live within the city walls. The merchant oligarchy succeeded the cathedral chapter as the major purchasers of land after 1250; they carried on their mercantile business in common with municipal or royal functions and sent their sons to England and Flanders to gain experience in overseas trade. A few families within the hermandades or confraternities like the Sarracín and Bonifaz succeeded in monopolising the post of alcalde, or mayor; a special court, the alcalde del rey was first mentioned at Burgos in 1281. By the reign of Alfonso X, the exemption of the non-noble knights and religious corporations, combined with exorbitant gifts and grants to monasteries and private individuals, placed great stress on the economic well-being of the realm. In the century following the conquest of Seville (1248) on the Moors, Burgos became a testing ground for royal policies of increasing power against the consejo, in part by encouraging the right to appeal from the consejo to the king. In 1285, Sancho IV added a new body to the consejo which came to dominate it: the jurado in charge of collecting taxes and overseeing public works; the king reserved the right to select its members. The city perceived that danger to its autonomy came rather from an uncontrolled aristocracy during royal minorities: Burgos joined the hermandades of cities that leagued together for mutual protection in 1295 and 1315. In the 14th century, official royal intrusion in city affairs was perceived as a palliative against outbreaks of violence by the large excluded class of smaller merchants and artisans, on whom the tax burden fell. The alguacil was the royal official instituted to judge disagreements. On 9 June 1345, sweeping aside the city government, Alfonso XI established direct royal rule of Burgos through the Regimiento of sixteen appointed men. In 1574, Pope Gregory XIII made the bishopric a Metropolitan archbishorpic, at the request of king Felipe II. Burgos has been the scene of many wars: with the Moors, the struggles between León and Navarre, and between Castile and Aragon. In the Peninsular War against Napoleonic France, the siege of Burgos (between 19 September to 21 October) was a scene of a withdrawal for Arthur Wellesley, 1st Duke of Wellington. Again in the 19th-century Carlist civil wars of the Spanish succession Burgos was the scene of a battle. During the Spanish Civil War, Burgos was the base of General Franco's rebel Nationalist government. At an elevation of 856 metres (2,808 ft), the city of Burgos experiences the continental-influenced Mediterranean climate (Kŏppen Cfb). Burgos' climate features very cool and windy winters due to altitude and an inland location. Winters always include snow and temperatures below freezing. Burgos' continentality is caused by two principal factors: distance from the sea and higher altitude. Temperature ranges can be extreme and Burgos is drier than Spain's coastal regions, although there is year-round precipitation. Average annual precipitation is 546 mm (21.5 in) and the average annual relative humidity is 72%. In winter, temperatures very often (almost every day) drop below freezing, often reaching temperatures as low as −10 °C (14 °F), and snowfalls are common, while the summer months see average high temperatures of 27.5 °C (81.5 °F). The lowest recorded temperature in Burgos was −21 °C (−6 °F) on 20 January 1885. The highest recorded temperature was 39 °C (102 °F) on 13 August 1987. Burgos is rich in ancient churches and convents. The three most notable are the cathedral, with its chapel of the Condestables de Castilla (Lords Constable of Castile), the monastery of Las Huelgas and the Carthusian monastery of Miraflores. Minor notable churches are San Esteban, San Gil (Sancti Aegidii), San Pedro, San Cosme y San Damián, Santiago (Sancti Jacobi), San Lorenzo and San Lesmes (Adelelmi). The Convento de la Merced, occupied by the Jesuits, and the Hospital del Rey are also of historic and architectural interest. Among the other interesting architectural structures, in the walls of the city are the famous gateway of Santa María, erected for the first entrance of the Emperor Charles V, and the arch of Fernán González. 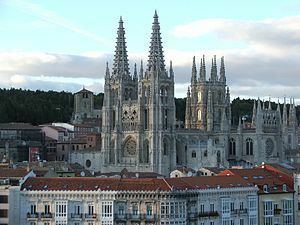 Construction on Burgos' Gothic Cathedral began in 1221 and spanned mainly from the 13th to 15th centuries. It has been declared a UNESCO World Heritage Site. The west front is flanked by towers terminating in octagonal spires covered with open stonework traceries. The middle section, which serves as an entrance, has three alabaster pilasters, the intercolumnar spaces bearing panel-pictures representing the martyrdom of saints. The façade possessed ornate and fantastic surface decoration. The octagonal chapel of the Condestable, in florid, thus highly sculpted, Gothic design, has a roof finished with balustraded turrets, needle-pointed pinnacles and statues. In the lower portion, coats of arms, shields and crouching lions have been worked into the ensemble. The exterior of the sacristy is decorated with carved traceries, figures of angels and armoured knights. The elaborate tabernacle is composed of two octagonal sections in Corinthian style. The Monasterio de las Huelgas Reales (Monastery of the Royal Retreats) on the outskirts of the city, was founded in 1180 by king Alfonso VIII, and was begun in a pre-Gothic style, although almost every style has been introduced over many additions. The remarkable cloisters have been described as "unrivalled for beauty both of detail and design, and perhaps unsurpassed by anything in its age and style in any part of Europe" (1911 Encyclopædia Britannica). One cloister has semicircular arches with delicate and varied columns; the other has an ogival style of early Gothic. The interior of the church has enormous columns supporting its magnificent vault; the entrance is modern. This convent historically benefited from extraordinary privileges granted to its abbess by kings and popes. The Carthusian monastery, Miraflores Charterhouse (Cartuja de Miraflores) is situated about four kilometres from the historic city center. Among the treasures of the Charterhouse are the wooden statue of St. Bruno, the wooden choir stalls in the church and the mausoleum of King Juan II and of his queen, Isabella of Portugal, constructed of marble and with their alabaster recumbent effigies. Around the top frieze are statues of angels in miniature. The French soldiers in the Spanish War of Independence (1814) mutilated this beautiful work, cutting off some of the heads and carrying them away to France. King Juan II's daughters by his first wife, heiresses Princessses Catherine and Eleanor of Asturias, are also buried in the monastery. The city preserves its medieval historic centre, corresponding to the city walls. Burgos has a total of 10 museums, the newest being the Museum of Human Evolution (the 10th most visited museum in Spain). 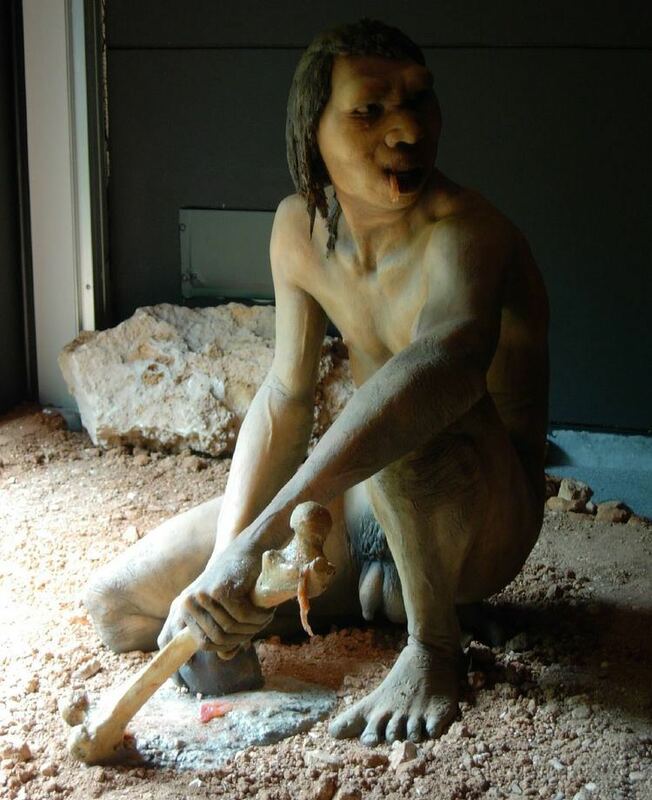 The Museum of Human Evolution was inaugurated on 13 July 2010. Its foundation is based on the archeological site of Atapuerca located 20 km (12 mi) east of Burgos. The Atapuerca site has been designated a UNESCO World Heritage Site. It contains several caves, where fossils and stone tools of the earliest known hominids in West Europe have been found, near Atapuerca Mountains. The museum also allows the visitor to travel to the archaeological site and biological park. It summarizes the history of the province of Burgos. It has important objects and documents from all the ages, starting from Atapuerca, passing to the Romans and Iberians, and finishing in the contemporary period. The museum is located in a renascence palace, the House of Íñigo Angulo, which has a main patio that structures the museum. Between the Main Square “Plaza Mayor” and the Promenade of the Espolón “Paseo del Espolón,” on the side street, Travesía del Mercado nº3, you find the Fadrique de Basilea Book Museum “Museo del Libro Fadrique de Basilea”, of the Burgos publisher, Siloé, a cosy museum that shows the history of the book from its first written form to its modern electronic form. State Education in Spain is free, and compulsory from 6 to 16 years. The current education system is called LOE (Ley Orgánica de Educación). Often abbreviated 'UBU', the University of Burgos is a public university with about 10,000 students studying over 30 different undergraduate degrees, over 20 PhD Programmes, as well as several Official Masters and other graduate courses. It was established in 1994 when it was divided from the University of Valladolid. UBU cooperates with the Erasmus Project, a European Union (EU) student-exchange programme, and each semester hosts students from various countries across the 15-state European Union, as well as Iceland, Lichtenstein, Norway, Malta and associated countries in Eastern Europe. Additionally, university students from various regions around the world including China, Latin and North America are able to participate in exchange programmes to study abroad at the University of Burgos. In total, the University of Burgos has education agreements with over 100 international academic institutions. Based in Burgos, it is a new-developed private online university which became operational during 2013. It offers distance and some classroom education. This University has been promoted by Education Campus of Castile and Leon. The photos below are taken from a very popular view point that requires quite a hike up stairs to El Castillo (the castle). There visitors can see all of Burgos. During special events throughout the year, visitors can see a firework display from that same view point. Most of the parks in the city of Burgos can be found along the river Arlanzón. Indeed, the banks of the river itself constitute a green corridor along the city. In total, there are nearly 3 square miles (1,878 acres) of parks in Burgos and one tree for every 3 inhabitants. Parque del Castillo (or the Castle Park) is one of the lungs of the city. The city grew from the southern foot of the hill of the castle. Gradually, some of the upper neighborhoods began disappearing. After the destruction of the castle, military installations were established there. In the 1950s, the engineer Jaquotot Mariano, who later became mayor of the city, decided to leave the hill completely bare. Besides the ruins of the castle, this park contains the Bird Conservation Center. It also has play areas for children and exercise. Also, there is a terraced area with gardens and an ornamental fountain. The highlight of the park is the viewpoint from which you get a great view of the city, especially the cathedral. A metal plaque on the rail at the vista point helps to identify the most characteristic places of the city. The park contains the unique view of the city of Burgos from the viewpoint of the Castle. Fuentes Blancas is Burgos' most visited large park extending east from the city along the river Arlanzón. It contains a network of walking and biking paths and includes camping and various outdoor recreational activities. Paseo del Espolón is the tree-lined promenade that is the most emblematic of Burgos. It's situated along the banks of the river Arlanzón, and consists of a landscaped walk that goes from the theater square to the Arc de Santa Maria, passing shops and cafes. It's a popular social spot for residents during the warm summer months. Paseo de la Isla is another one of Burgos' beautiful tree-lined garden walks. It passes by the Palacio de la Isla which served as one of Franco's headquarters during the Spanish Civil War and is currently the Language Institute of Castilian and Leonese. Burgos is a rich city, with a GDP above the Spain average. It is an important trade and tourist center with some manufacturing. Wheat is a major crop. The city is surrounded by wheat fields. Burgos is a very industrial city, with a secondary sector widely developed. The city has the biggest industrial park of north Spain, called Villalonquéjar. The city is the headquarters of Grupo Antolin, designer and manufacturer of interior automotive components. It is also the headquarters for south Europe Benteler International. It employs the bigger percentage in the city and is represented by the public sector (production, delivery and allocation of goods and services), due to the capital status. The city has a complete culture infrastructure, remarked by the Auditorio y Palacio de Congresos de Burgos, which opened in mid-2012. Spanish, also called Castilian, originated in Castile and spread throughout the Crown of Castile's possessions following the reconquista. It was eventually dispersed throughout the Spanish empire following the conquest and colonization of the Americas, and Spain after the union of the Catholic Monarchs's kingdoms being co-spoken with other languages. Of the many different variations and dialects found throughout the world, it's argued that the purest Spanish can be found in the region of Burgos due to the fact that the language first developed here in the 10th-century. The Spanish language can be traced back to the monastery of Valpuesta located 100 km (62 mi) north-east of the city of Burgos. The Valpuesta cartularies are significant in the history of the Spanish language, and their status as manuscripts containing the earliest words written in Spanish has been officially recognised. 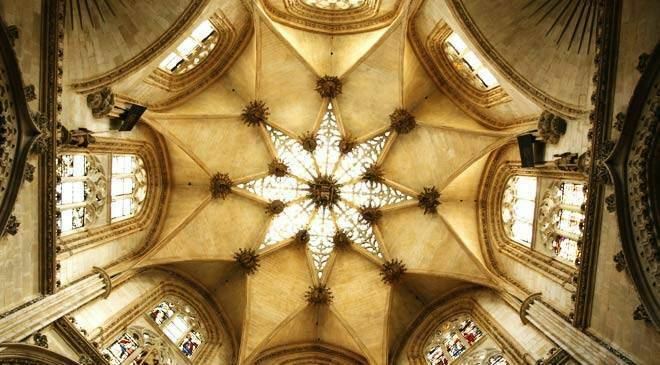 The first utterings of Spanish continued in the “Silos Glosses”, recorded in the Burgos monastery of Santo Domingo de Silos. Queso de Burgos, a white cheese which is soft and unctuous (because it is made with whey). Although originally made with sheep's milk, now cow's milk or mixtures are more common. Each comarca (rural district) produces a minor variation, and the major dairies produce an industrial product that is acceptable for people with sensitive digestion. Burgos is blessed with a moderate climate and this fresh cheese was able to be conserved there without the need for curing of more than 10 days. With the improvement of aseptic industrial production processes this can be extended to about 30 days at a cool 6 °C. Its production reaches 35,000 tons annually. Morcilla de Burgos, a pig's-blood sausage (black pudding), is a staple country food famous across the Iberian peninsula. Spiced with onions and herbs its most noticeable content is rice (often mistaken for fat) which makes it one of the lightest and healthiest products of its kind. Oral tradition says that it must be "salty, smooth and piquant" (see Spanish pages Burgos (desambiguación) for details). As with the Queso de Burgos, several comarcas or towns in the province (Cardeñadijo, Sotopalacios, Aranda de Duero, Briviesca, Covarrubias, Villarcayo, Trespaderne, Miranda de Ebro...) made their own morcillas, with minor variations between them. Even though Burgos is not on a D.O. wine is a fundamental piece in local gastronomy thanks to nearby wine cellars from Ribera de Duero, Rioja and Arlanza D.O. Burgos Airport is located only 5 km (3.11 mi) from the city centre, with daily flights to Barcelona International Airport, and during spring and summer to Palma de Mallorca and Paris Orly. The city is considered a first-class rail route through which one rail lines circulate, operated by Renfe: Madrid-Irun. The faster trains use the AVE line between Madrid and Valladolid. 2010 marked 150 years since the arrival of the first railway to the city; the first train was present on October 25, 1860. Madrid was joined with the French border and this was considered the main route of railway communication between Spain and Europe. Located at the halfway point, Burgos soon become an important hub of communications between the centre and the north. Since December 2007, the city has been connected to the main provincial capitals by high-speed service Alvia. It also provides other services, middle and long distance, which connect with the main population centres of the country. 18 long distance trains and 12 middle distance trains circulate through the station each day, which results in around 330,000 yearly users. The new railway station was opened on 12 December 2008 under the name Burgos-Rosa de Lima, belonging to ADIF. It is located in the neighbourhood of Villímar, northeast of the city, and has been adapted for the future arrival of the AVE. Bus 25 will take you direct to the city centre. In 2017, AVE high speed trains will serve the city, connecting it to cities such as Madrid in only 84 minutes, or Bilbao in 70 minutes. A project to implement a tram for the city has been planned, which would run the length of the Boulevard, officially called the Avenida de Valencia. It would consist of a line of about 12 km (7 mi) long and will originate from the Burgos-Rosa de Lima railway station and end at the University of Burgos. Its cost is estimated between 80 and 120 million euros. Due to the economic crisis and real estate, the project has been postponed temporarily until further funding becomes available. In February 2010 work began on the development of the Boulevard, which reserves a lane for public transport: first buses, and eventually the tram. Burgos has an international bus station located in the city centre, just one hundred meters from the Cathedral. It connects the city with nearly every region of Spain, as well as with a wide number of European (Amsterdam, Basel, Bern, Bratislava, Brussels, Cologne, Hamburg, Frankfurt, Geneva, Gdańsk, Kiev, Lisbon, Ljubljana, Lviv, Łódź, London, Lyon, Marseille, Moscow, Munich, Nice, Paris, Porto, Prague, Rotterdam, Sofia, The Hague, Warsaw, Zürich) and even North African (Casablanca, Marrakech, Rabat) cities. The city has its own public bicycle rental system, called Bicibur. It has been designed by a local company and has more than 20 points of distribution throughout the city. A network of over 100 km (62 mi) of bicycle lanes net the city making it the 6th largest bicycle lane network in Spain and the first in kilometres per resident. Burgos has undertaken many efforts concerning sustainable mobility, and it won the CiViTAs City of the Year in 2007, the most important Award at the European level and the Energy Globe Award in 2008 (the sustainability Nobel awards) in the Air Category for the same reason. The city is the leader among Spanish cities in terms of sustainable mobility with big efforts for a city centre free of cars, a free bicycle loan system and 100% clean public transport. Burgos now leads the CiViNET Network of cities concerned with sustainable mobility in Spain and Portugal. The mayors of Bruges in Belgium's Flemish Region and Burgos signed a treaty on 29 January 2007 in Bruges's city hall for future cooperation. This engagement could be seen as a prologue on the opening of the exhibition Comeliness and Madness. This exhibition on king Philip the Handsome -who also ruled the Burgundian countries- took place in the Casa del Cordón in Burgos where the monarch died. On 30 January 2007, the exhibition opened in Bruges, the city where Philip the Handsome was born and where the urn with his heart is kept in Onthaalkerk O.L.V. (the Church of Our Lady). Burgos and San Juan de los Lagos sponsor and coordinate activities between both populations. Segundo de Chomón filmed a short documentary about this city in 1911. Burgos is the setting for one of the scenes in the 2010 film "The Way" by Emilio Estevez starring his father Martin Sheen.